The board of the Brethren Encyclopeda Project, which is the sponsor of the upcoming Fifth Brethren World Assembly to meet in Brookville, Ohio, the summer of 2013, met yesterday at Ashland (OH) Theological Seminary. A special feature of the meeting was a tour conducted by Dr. John Byron (pictured, at right) of the New Testament faculty of the seminary. 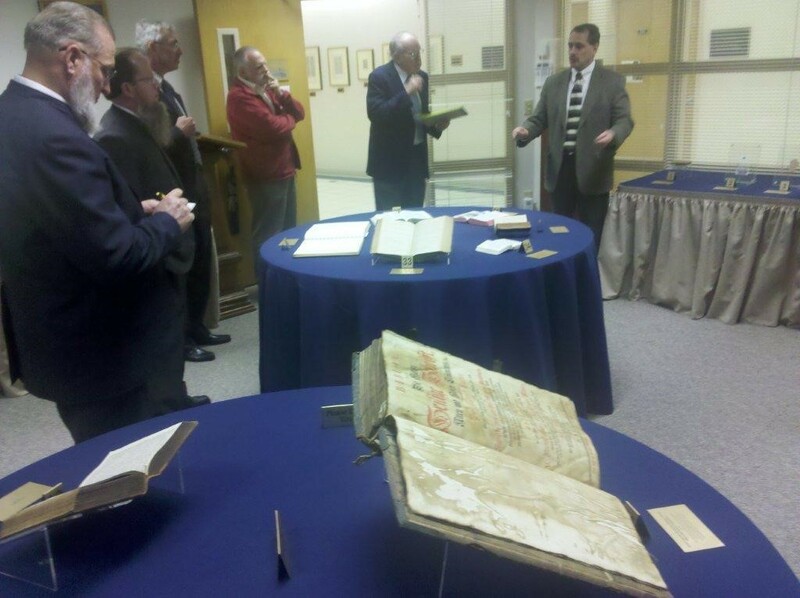 He gave historical background and commentary on the seminary’s current display of 38 historic biblical documents, including a portion of the Dead Sea Scrolls, several Sauer Bibles, and much more. Monograph editor Jeff Bach is preparing an update of Donald Durnbaugh’s “Brethren Beginnings,” as well as beginning work on a manuscript on Brethren and Universalism, an update of Dale Stoffer’s “Background and Development of Brethren Doctrines,” and a thesis on Brethren hymn texts of the mid-nineteenth century. The Brethren Encyclopedia Board, which is comprised of representatives of the six major groups descended from Alexander Mack’s founding of the Brethren Church in 1708, will next meet on Monday, October 17. The steering committee for the Fifth Brethren World Assembly, on which the FGBC is represented by Tom Julien, will meet on May 6.